Enjoy spectacular scenery complete with exquisite dining, served in an elegant atmosphere by friendly and outgoing staff. Three double bedrooms (2 with full-size lower beds), shower, dining room complete with custom china, stemware, gold-plated flatware, and gourmet meal service. Large observation lounge with wet bar and solid marble gas-log fireplace, open rear platform. 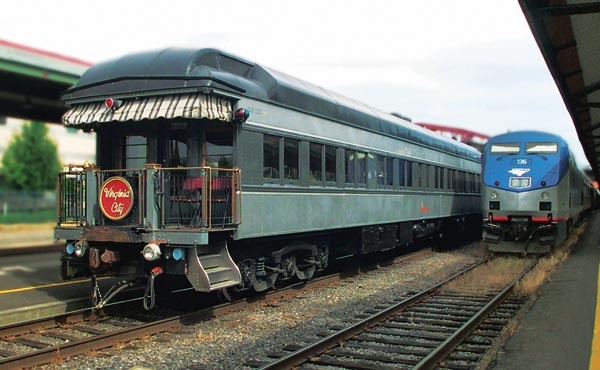 Pullman-built in 1928 as Crystal Peak for the “Overland Limited.” Renamed Golden Peak in 1938; assigned to the “Golden State Limited.” Lucius Beebe and Charles Clegg purchased the car in 1954 and created a one-of-a-kind Venetian Renaissance interior. 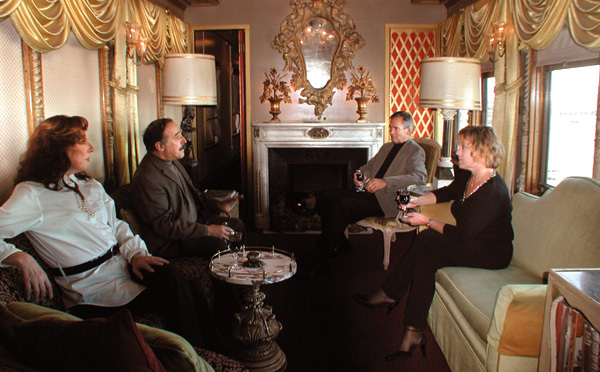 Present owner has restored the interior to original circa 1955 opulence.